(CNSNews.com) - In the ten-year period from 2003 to 2012, the number of American children 5 through 17 years old who were being homeschooled by their parents climbed by 61.8 percent, according to newly released data from the U.S. Department of Education. At the same time, the percentage of all U.S. students in the 5-through-17 age group who were homeschooled increased from 2.2 percent to 3.4 percent. Homeschooling is most prevalent in two-parent families where one parent works and the other does not, according to the DOE data. Among this type of family, 5.3 percent of all students are homeschooled. There are also patterns in the data: The more educated the parents, the more likely they are to homeschool their children and middle-income parents are more likely to homeschool than poorer or wealthier parents. In 2003, according to the DOE estimate, there were 1,096,000 homeschooled children in the 5-through-17 age group in the United States. That equaled 2.2 percent of the 50,707,000 students in that age bracket the United States that year. In 2007, there were 1,520,000 homeschooled children in the 5-through-17 age group, according to the DOE estimate. That equaled 3.0 percent of the 51,135,000 students in the 5-through-17 age group that year. By 2012, the latest year reported with the new data, there were 1,773,000 homeschooled in the 5-through-17 age bracket. That equaled 3.4 percent of the 51,657,000 students in the 5-through-17 age group that year. 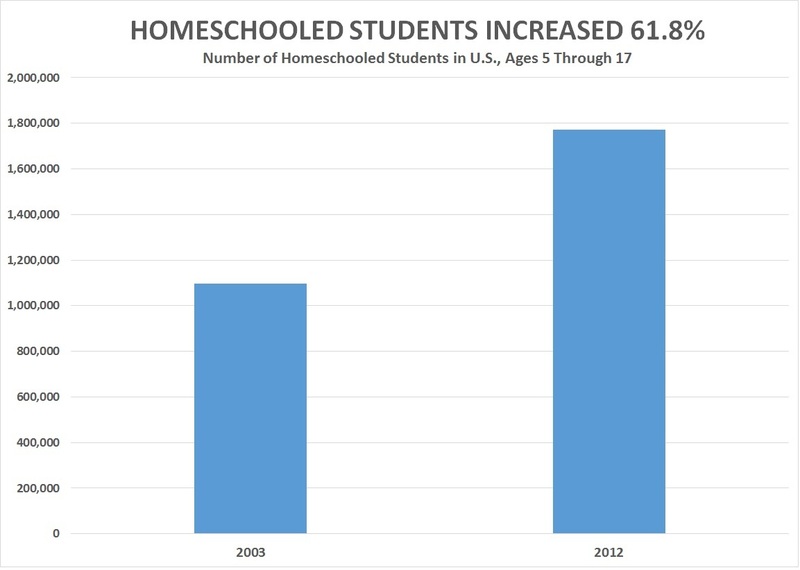 The climb from 1,096,000 homeschooled students in 2003 to 1,773,000 in 2012 represented an increase of 677,000—or 61.8 percent--in the number of homeschooled students in the country. The 1,773,000 homeschooled students in the United States in 2012 outnumbered the Census Bureau’s 2013 population estimates for all U.S. cities except New York (8,175,133), Los Angeles (3,792,621), Chicago (2,695,598), and Houston (2,099,451). The 677,000 increase in homeschooled students from 2003 to 2012 is more than the populations of Memphis (653,450), Seattle (652,405), Boston (645,966) and Washington, D.C. (646,449). Two-parent households in which only one-parent works (is “in the labor force”) were the most likely family unit to homeschool a child, according to DOE. In 2012, the department estimated, there were 11,581,000 students ages 5 through 17 who lived in a family fitting this description. Of those, 618,000—or 5.3 percent—were homeschooled. At the same time, there were 22,884,000 students who lived in a family with two parents, where both parents worked. Of these students, 295,000—or 1.3 percent—were homeschooled. Another 13,083,000 students lived in a family with only one parent, who was also working. Of those, 96,000—or 0.7 percent were homeschooled. There were also 4,108,000 students who had no parent in the labor force. Of these, 74,000—or 1.8 percent were homeschooled. The Department of Education also estimated homeschooling numbers by the “highest education level of parents.” Only an estimated 1.6 percent of students whose parents had a high school diploma or less were homeschooled. 2.2 percent of students whose parents had vocational/technical or some college education were homeschooled. 2.4 percent of students whose parents had a bachelor’s degree or some graduate school were homeschooled. And 2.5 percent of students whose parents had a graduate or professional degree were homeschooled. Children from the poorest and the wealthiest homes were least likely to be homeschooled, according to the DOE estimates. Only 0.8 percent of students from homes with a household income of $20,000 or less were homeschooled, and only 1.6 percent of those from homes with a household income of over $100,000 were homeschooled. By contrast, 2.3 percent students from homes with a household incomes of $20,001 to $50,000 were homeschooled, 3.0 percent of students from homes with household incomes of $50,001 to $75,000 were homeschooled, and 3.0 percent of students from homes with household incomes of $75,01 to $100,000 were homeschooled. The data on homeschooled students is published in Table 206.10 of the Digest of Education Statistics 2013, which was published on May 7. “The National Center for Education Statistics uses a statistical adjustment for estimates of total homeschoolers in 2012,” says a footnote to the table. The 2003 and 2007 DOE estimates on homeschooling in the United States were based on a phone survey. The 2012 estimates were based on a mail survey.